Sunday 20th October at 11.30am. Vintage Event in the ‘Rapa – pencil it in! 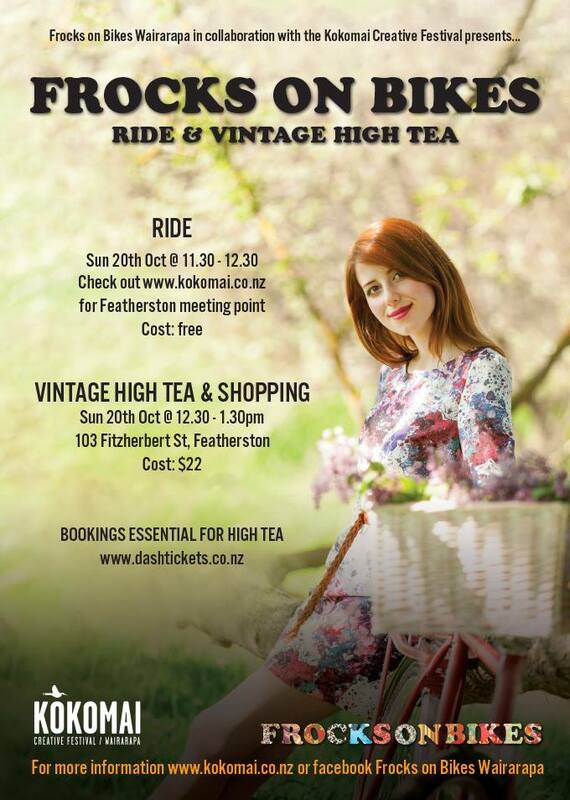 Just letting you know that we have an exciting vintage event bubbling away as part of the Kokomai Creative festival on Sunday 20th Oct – so mark that in your diaries…a leisurely ride, high tea lunch, shopping and for those of you keen a vintage swing dance class…more details will emerge! 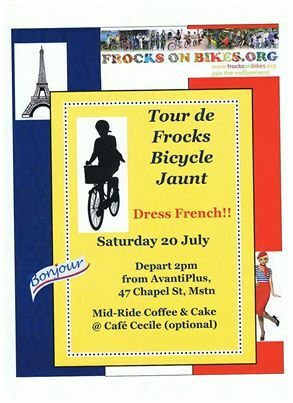 A quiet, easy, bike ride around Masterton in a fashionable French way. Coffee break at Café Cecile – I believe they have some French pastries for us. Our annual Love to Roll date ride is here again on the 2nd of March. Join Frocks On Bikes for a fresh, fun and summery cruise to the Fringe Festival in the city (either busking circus show, Campground Chaos outside St Johns, or Wheels of Justice at Bike Barn – must pre-book tickets). 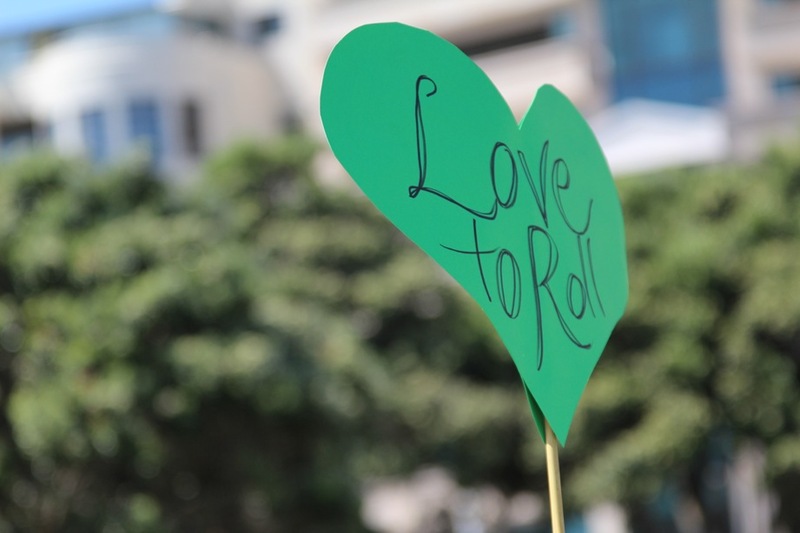 Love To Roll goes from sea to city this year, so dress for a date, bring company and meet at Lyall Bay (Maranui Cafe) at 11am for coffee before we roll for a leisurely ride to town. And if this wasn’t enough, at Love To Roll 2013 we’ll be raffling amazing date prizes – dinners for two in Welly’s finest eateries (Martin Bosley, Olive, Finc, Monterey and Sweet Mother’s Kitchen), a Beautiful Bike Bag AND a Giant Suede bike from Giant Wellington! Meet at 11am for coffee, ready to roll at 12 noon, 2nd March at Maranui, Lyall Parade. Bring your keep cup and cash for raffle tickets or quick coffee orders. Bikewise month – 13th FebruaryFebruary is Bikewise month! We’ll try to keep you posted on all the events planned around Wellington. Keep an eye on our calendar for details, but frankly there’s so much great stuff happening you should check out the Bikewise Events page online. MUST DO EVENT! Ink it on your social calendar: ‘Go By Bike Day’ on the 13th of February. Free breakfast! 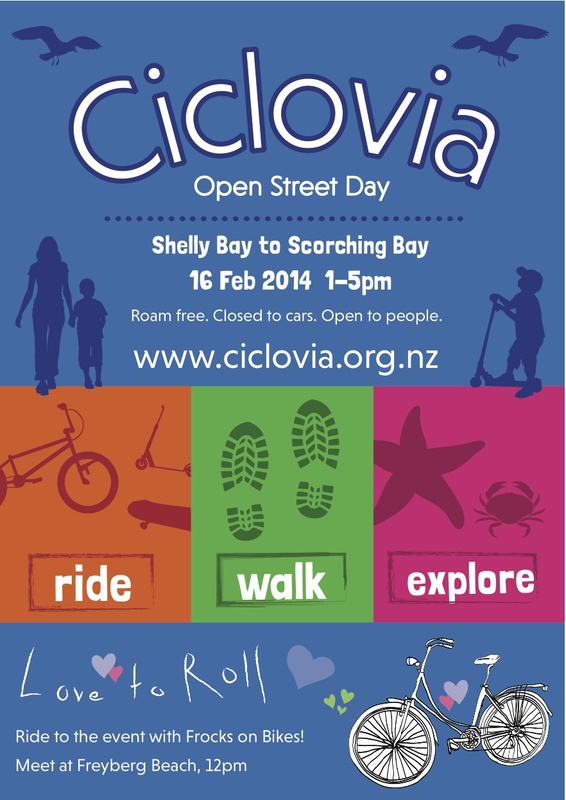 Open to everyone with a bike, from 6.30am under the sails on Queens Wharf. 20th Feb – Meet for a pre-movie ride at 7pm at the north side of the Wharewaka (near Taranaki St). We’ll cruise the waterfront to stretch our legs before settling in at Waitangi Park for Searching for Sugarman. (We know these movies are always packed out, so we’ve planned it to stake out a good spot)If the movie is cancelled, then the ride will be too. Keep an eye on the WCC website or facebook.Bring picnic blankets, food, wine, bike lights and something warm for after dark. Grab your floral dress, or plus fours and tweed blazer, for a fun day out to celebrate the opening of the final section of the Greytown to Woodside Trail on Sunday 3 February. The Greytown Trails Trust has organised Wairarapa’s first ever ‘Tweed Run’ to celebrate the recent completion of ‘Stage 2’ from Woodside Rd to the Station, and the three years of hard work that’s gone into creating the 5km Greytown to Woodside cycling and walking TrailThe public is invited to bring a picnic to the Tweed Run, and there will also be refreshments available on the Trail. The event will include prizes for best costumes, and dogs are welcome on a lead, either in costume or ‘au natural’. For updates and more information go to Greytown Trails on Facebook.